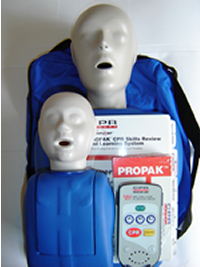 CPR Prompt manikins are designed to provide affordable one-student to one-manikin training in CPR, AED use, and the Heimlich maneuver. Made to last, they have been tested to withstand the equivalent of 10,000 student usages. Both manikins feature proper head tilt/chin lift to open the airway, visible chest rise, anatomical landmarks, and an audible compression clicker (adult & child only) to ensure proper technique. 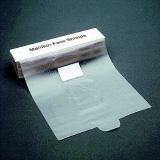 Both are lightweight, portable and require minimal cleaning when used with the single use face shield/lung bags. 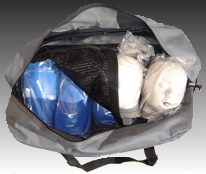 5 Adult/Child cpr manikins and 2 Infant cpr manikins packed in a durable nylon carrying case with 50 Adult/Child & 20 Infant cpr faceshield/lung bags and insertion tool. 18.25 lbs. 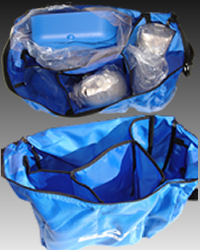 5 Adult/Child cpr manikins packed in a durable nylon carrying case with 50 cpr faceshield/lung bags and insertion tool. 15lbs. 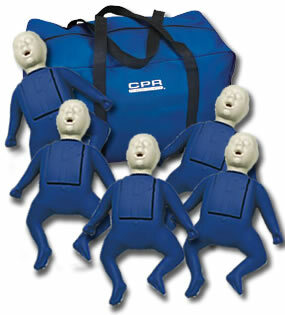 5 Infant cpr manikins packed in a durable nylon carrying case with 50 cpr faceshield/lung bags and insertion tool. 8 lbs. 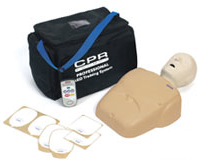 This economical pack of CPR Prompt® training manikins allows any instructor the ability to teach adult, child, and infant CPR in one simple pack. Use of AED trainers may also be an option for more complete training. Package includes one adult/child manikin, one infant torso manikin, 10 adult/child faceshield/lung bags, insertion tools, and nylon carry bag. Note: only use AED pads designed for foam body manikins. Adult/Child CPR Training manikins w/10 Adult/Child cpr face shield lung bags and lung bag insertion tool. 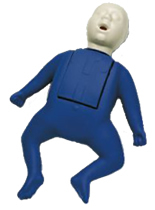 Save money by buying one manikin for both adult and child training needs. The age selector dial adjusts the compression depth required for adult or child CPR. Packed in a cardboard carrying case with instructions. One-year warranty. 3.6 lbs. Infant CPR Training manikin w/10 Infant cpr face shield lung bags and lung bag insertion tool. Features removable chest plate for easy lung bag installation. The inner chest plate gives students a "bottoming out" feel to ensure proper technique. One-year warranty. 1.6 lbs. 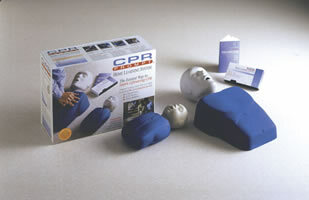 Designed for the Professional CPR Instructor in mind. 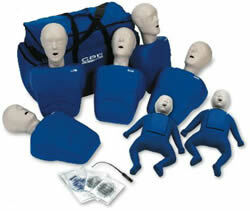 Includes: Adult/Child CPR Training manikins w/10 Adult/Child cpr face shield lung bags and lung bag insertion tool. Infant CPR Training manikin w/10 Infant cpr face shield lung bags and lung bag insertion tool. Features removable chest plate for easy lung bag installation. The inner chest plate gives students a "bottoming out" feel to ensure proper technique. 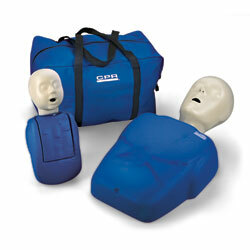 Includes CPR Prompt Health Care Provider CPR Skills Review & Learning DVD & CPR 300 audio rescue aid. One-year warranty. 5 lbs. All CPR instructors must be current on their skills and supplies to meet the American Heart Association CPR training guidelines. That means providing students with the latest in-class tools, including CPR voice prompts (AHA recommended) as well as AED instruction. The AED Trainer included allows the instructor to select from four training scenarios for manual and hands-free training. 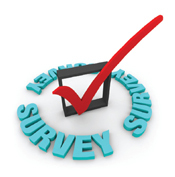 Once the scenario is selected the trainer will prompt the student in appropriate action and responses. 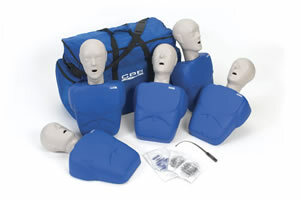 Includes: one adult/child manikin; CPR Prompt® Rescue and Practice Aid voice prompt; AED Trainer; ElectroLast™ AED trainer electrode peel-off pads to fit the AED trainer electrodes; 10 adult face shield/lung bags; and heavy-duty nylon bag with room to store your AED trainer. Three-year warranty. (ElectroLast™ AED trainer electrode peel-off pads not included in the warranty.) 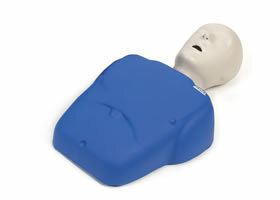 Note: When using foam-bodied manikins for AED training, use only pads designed for foam bodies. 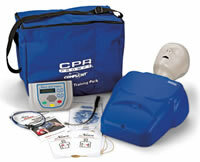 ADD AN AED TRAINER TO THIS PACKAGE - Click here for AED Trainers models & prices! - separate compartment for AED trainer storage (AED trainer not included). Add an AED TRAINER - Click here for AED Trainers models & prices! The most valuable, important investment you can make - a comprehensive do it yourself training system that helps the entire family learn CPR and choking first aid skills at home. By combining realistic practice manikins featuring anatomical and built-in feedback with the interactive DVD, you receive all the tools you need to learn CPR at home - at your own pace an at your convenience. 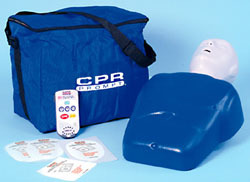 The Home Learning System covers procedures for adult, child and infant CPR. Includes: One adult/child CPR manikins, one infant CPR mannequin, one interactive DVD, 10 Adult cpr face shield lung bags, 10 Infant cpr face shiled lung bags, a Supplemental Learning Guide, and a one-year warranty. Not intended for commercial use. - 6 lbs. This complete kit includes everything an instructor needs to teach effective CPR to students and members of the community. 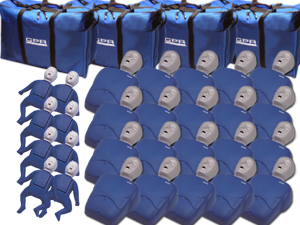 Included are one adult/child manikin, one infant manikin, 25 adult/child faceshield/lung bags, 25 infant faceshield/lung bags, insertion tools, CPR DVD, and a nylon carry bag. Note: If also used for AED training, be sure to use training pads specifically for foam body manikins. Three year warranty. 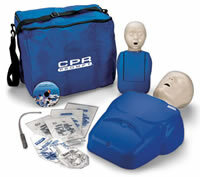 Includes: one adult/child manikin; CPR Prompt® Rescue and Practice Aid voice prompt; ElectroLast AED trainer electrode peel-off pads to fit your national brand AED trainer electrodes; 10 adult face shield/lung bags; and heavy-duty nylon bag with room to store an AED trainer (not included). One-year warranty with the exception of the ElectroLast AED trainer electrode peel-off pads. Using patented microchip technology; the CPR Prompt Audio Rescue and Practice Aid is a voice-prompting device that talks students and CPR-trained individuals through every step of adult, child and infant CPR, in real time. It is a perfect tool to help train students in CPR and coach First Responders during a real emergency. The CPR Prompt Audio Rescue and Practice Aid meets American Heart Association recommendations for "improving acquisition of CPR psychomotor skills". This pocket/keychain version is invaluable to have during an emergency. 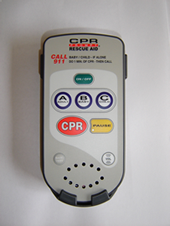 Simply turn the unit on and a calm voice will coach you through the steps of CPR. One year warranty. Provides audible and visual indicators to help deliver chest compressions and ventilation in accordance with American Heart Association Guidelines. • LED flashlight to help check airway, or find your keys. • Buttons for Layperson or Professional rescuers. • Visual as well as audio indication of breaths and compressions. • Includes a Facesheild, set of gloves, and a carrying case. 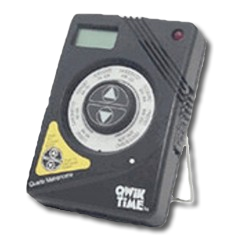 Qwik Time Metronome Help your class learn the proper pace for compressions and rescue breaths with this conveniently sized metronome. Excellent volume (for large or small classes) with over 200 speed settings. Healthcare Provider CPR DVD includes skills review for One Rescuer CPR, Two Rescuer CPR, Barrier Devices, Foreign-Body Airway Obstruction Management. Follows the 2005 American Heart Association Guidelines.